If everyone is focused on Earth, who is looking up in the sky? That is what renowned astrophysicist Dr Neil deGrasse Tyson said to regional media during a press conference Thursday at the ArtScience Museum. He was here to promote the launch of television mini-series “Cosmos: A Spacetime Odyssey”, the sequel to the iconic first Cosmos series helmed by the late astrophysicist Carl Sagan three decades ago. Dr Tyson, who hosts the new series, was responding to a query by a member of the Singapore media who brought up the local government’s recent move to remove astronomy from general science curriculum. Speaking about his experiences in school, Dr Tyson explained how US public’ schools’ previous focus on Earth science limits the scope of astronomy. “Of course the Earth is important — I won’t deny that. But… if you think of Earth only as a place where you live rather than as a planet among many, you are deprived of a cosmic perspective that can completely shape your life,” said Dr Tyson. The astrophysicist hopes these close shaves will be important lessons for a populace that may ignore the study of space. “If you are coming between us and our communication technologies and you are this huge space rock, I would like to believe that would be a wake-up call to nations of the world to think about how we might protect ourselves from any future collision with Apophis, or any other asteroid that might hit,” said Dr Tyson. Producer Druyan hopes the new show will be a “transcending, far-reaching, transporting television experience” and will get to surface some of the “rigorous skepticism and sense of soaring wonder” that seems to be missing in other science documentaries out there. She also hopes to make the show accessible and inclusive to anyone, including the social media generation that may be apathetic to space development. Expounding her point, Druyan recalled a scene where Dr Tyson stares in the camera and says “Can you hear me?”. “All of us who use social media rarely give a thought to the underlying science that makes it possible for all of us to communicate with each other at the speed of light. 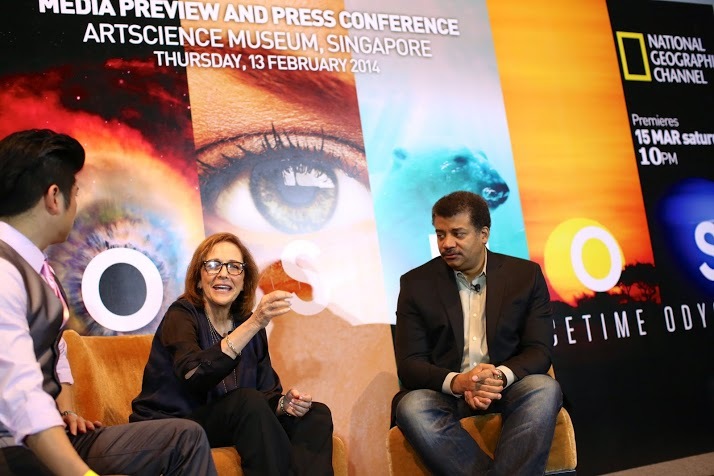 (Cosmos helps) to give a sense of the roots of our technology and science,” said Druyan. Famous actor Seth MacFarlane is also involved as executive producer in the mini-series, who Druyan calls “the greatest kind of collaborator”. She explains that MacFarlane suggested using animation sequences to explain the time-travel sequences and personal stories of figures past whose theories were instrumental in today’s understanding of astrophysics. Yes, MacFarlane also does voice work for some of the characters, along with other guests such as Richard Gere, Kirsten Dunst and Alfred Molina. Watching the preview of the mini-series, Cosmos feels larger than life with excellent CGI and detailed grahpics — partly attributed to director of photography Bill Pope, who filmed The Matrix and Spiderman films. However, what makes Cosmos as epic as its visual is the soundtrack, engineered for maximum impact. Druyan credits composer Alan Silvestri for the “sense of longing” that he creates for every soundtrack to the mini-series. Silvestri also composed for the Back to the Future trilogy and Forrest Gump. Dr Tyson hopes he can do the new Cosmos series justice. He met the late Sagan when he was 17, after the scientist invited him to take a tour of his laboratory. Tyson had submitted an application to Cornell University and Sagan sent a letter inviting him for the personal tour. After that, Sagan wrote his phone number on a piece of paper and asked Tyson to call him if he could not get home due to the bad weather; Sagan would offer him his place to stay for the night. Cosmos: A Spacetime Odyssey premieres March 15, 10pm on the National Geographic Channel. It will also be simulcast on NGC HD, Nat Geo Wild, Nat Geo People, FOX, FX and FOXCRIME channels. New episodes premiere on following Saturdays at 10pm.